Is it ever too early to optimize? I got to spend Thursday and Friday last week hanging out at the Jet Propulsion Labs in Pasadena. The home of real rocket scientists. The big excitement there is the two MERs (Mars Exploration Rovers) that are on their way to Mars now. Check it out at jpl.nasa.gov. This photo is from the viewing gallery above the "Mars Room" where mission controllers are practicing all phases of the flight. The big device in the lower part of the picture is the lander itself. 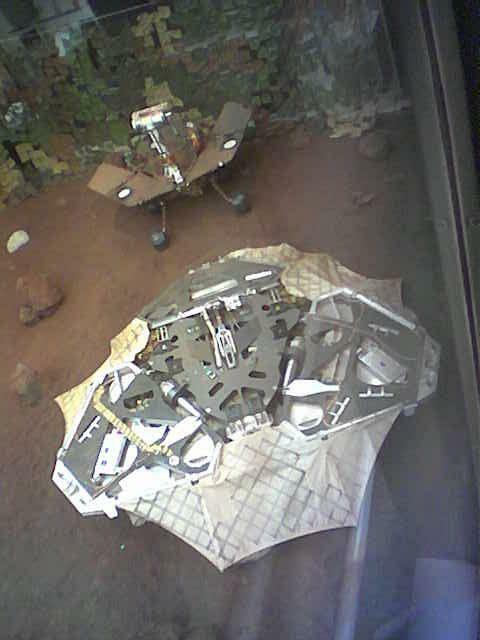 Above it is the rover, just after a practice landing. They're doing everything they can to make sure that at least one of the missions is successful.